Interview With Alan Flusser | Keikari.com Interview With Alan Flusser | On classic men's style, elegance and the beautiful life. “Age 66 [two years ago, when this interview took place], occupation — bricklayer. Graduate of University of Pennsylvania, took textile courses at FIT and illustration courses at Parsons. Have two daughters, 28 and 31, and one wife; yes they all appreciate fashion and my enthusiasm for it. My brother is a writer and my parents deceased. My father was considered something of a dandy in his day and my Mother had a lot of personal style. My sense of style was developed before websites existed, and, yes, I am a long-time student and, I guess, now an authority on men’s fashion and style. As you know, I’ve penned 5 books on the subject. [As for my style], you should look on the web or in my books for reflections of my style. I wear my own custom made and designed clothes mixed with some designer, second hand, vintage clothes in a highly eclectic, improvisational manner. I do design most of my clothes that I can. Otherwise I fill in with elements of other sources that I find along the way, such as Polo, Puma, Nike, Belgian shoes, Gucci loafers, Western clothes, etc. My goal in writing is to inform, teach, educate, and generally demystify the rare art of masculine dressing. Dressing The Man is by far my most important book. I will launch a new website this month which will contain a tremendous amount of new visual and written material relative to the larger subject of dressing well. [Regarding Wall Street,] I designed Michael’s wardrobe to project the image that the costume designers wanted for him. 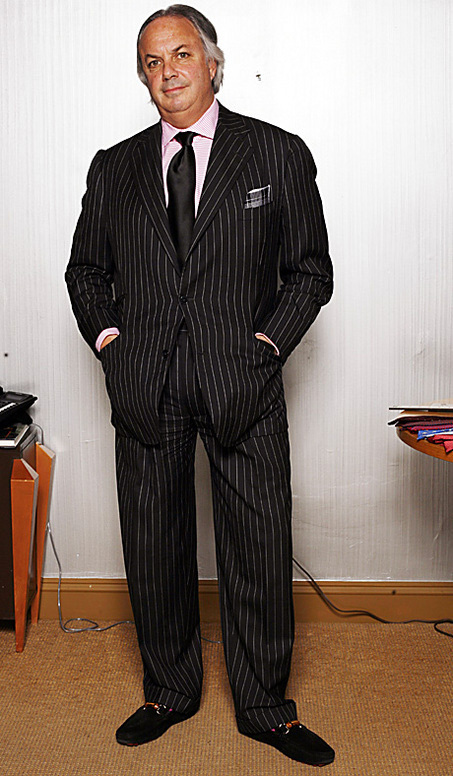 I was already custom-making these kind of clothes for our Wall Street customers, and it was nothing more particular than those clothes that my custom customers as well as myself were sporting back in those days. They attracted attention because this kind of highbrow dressing was generally not available to the larger fashion-buying public.